Don't even think about buying this El Camino. 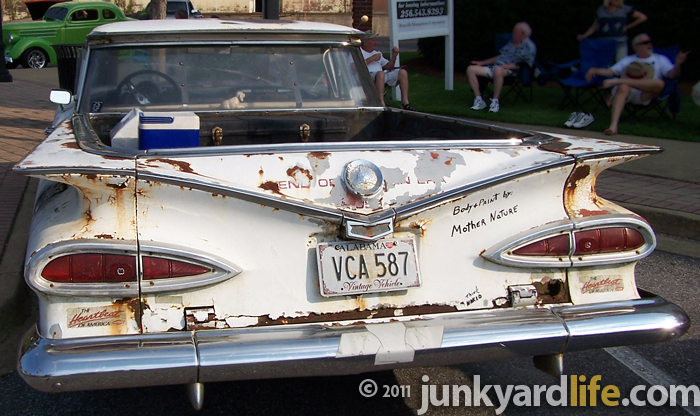 Bruce King, a 54-year-old from Hartselle, Alabama, loves everything about his 1959 Chevrolet El Camino. 25 years ago he traded his '78 Camaro for the keys to the low-slung pickup. “This car is the most fun to drive of any that I’ve owned,” said King. Custom flames, mag wheels, layers of peeling paint, rust and graffiti surround the enthusiastic owner. 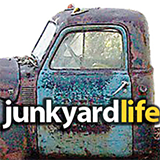 King's resourcefulness is evident and necessary in keeping the 52-year-old vehicle road-worthy. This one-of-a-kind, first generation El Camino is a direct reflection of King's personality and it draws a crowd wherever he goes. 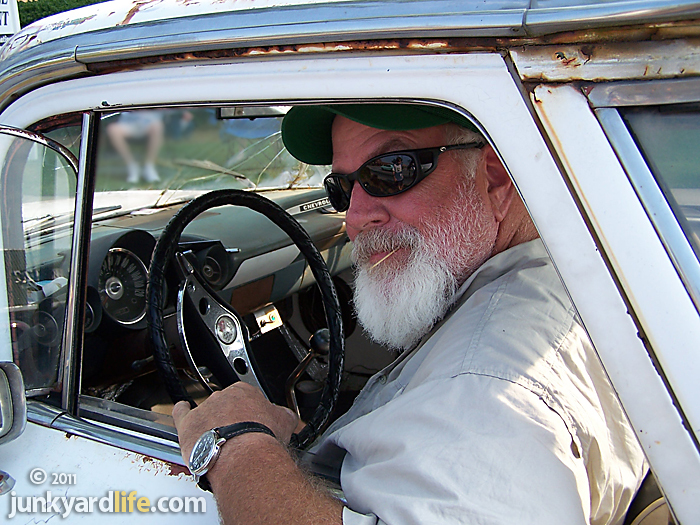 Bruce King behind the wheel of his '59 El Camino. 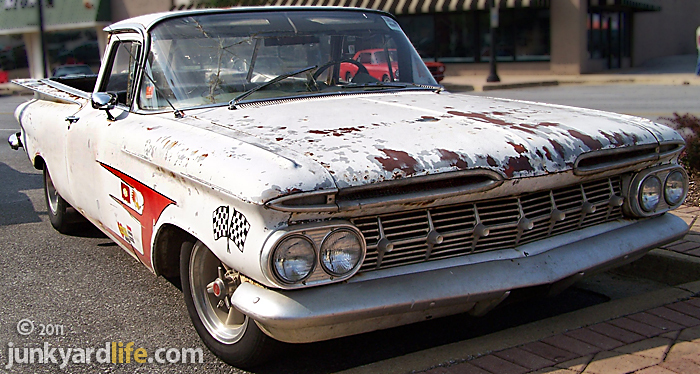 Throughout King's ownership the Chevy has continually evolved. 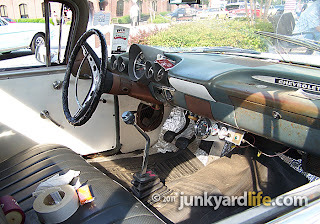 “The Chevy had the original 6 cylinder engine and straight shift transmission with column shift when I bought it,” said King. “It was painted in red oxide primer.” People often ask King when he is going to finish the truck. "It is finished!" 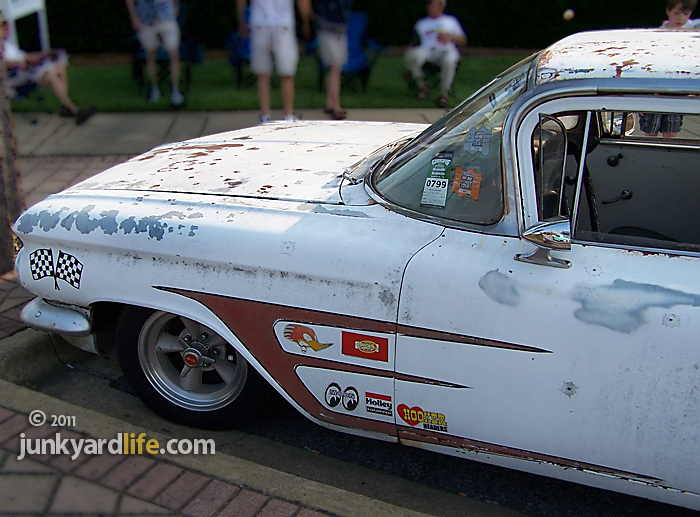 King has owned scores of ‘50s and ‘60s model cars through the years but his favorite remains this El Camino. Beneath the disappearing flat white paint, red oxide primer. 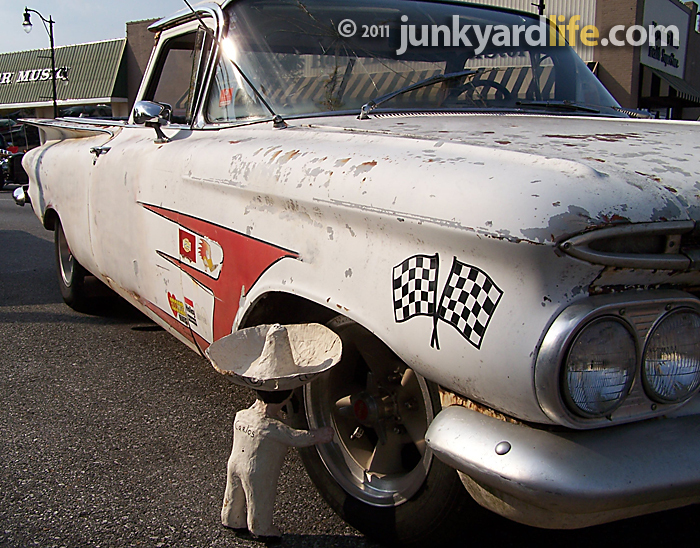 King says high speeds in a '59 El Camino will do that. King once drove the El Camino to Indianapolis Motor Speedway for a car show and wound up driving his car around the track with a cameraman hanging off the tailgate. “A production crew was filming some old hot rods making laps around the track for a TV show,” said King. The television guys wanted to film from on board King's El Camino. 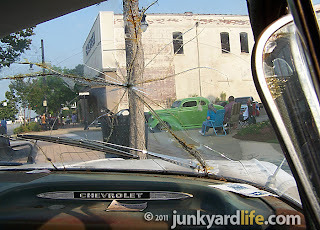 "Two camera guys were hanging on for dear life.” King pedaled the Chevy around Indy at a pretty good clip in front of a pack of hot rods. Top end-friendly 2.73 gears and tall rear tires helped the El Camino reach ‘Oh crap!’ speed at the flat 2.5-mile track. Luckily the camera guys survived and King’s El Camino even received some screen time. 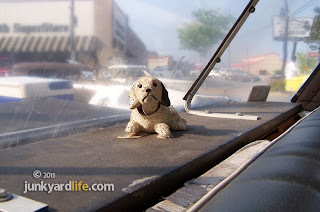 King's wife does not like the passenger's seat view in the '59 El Camino. King’s wife, Jill, has ridden in the El Camino only a handful of times. 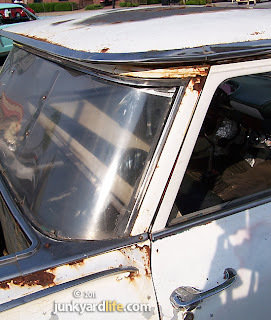 “I believe she’s been on 10 or 11 trips in it,” King said with raised eyebrows. His wife, sitting nearby, quickly flashed three fingers. “Three times. I’ve been in that thing three times,” said Jill, King’s wife of 29 years. 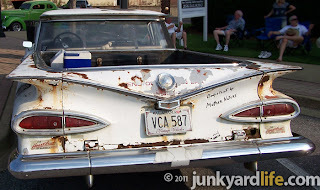 If you see someone riding King's bumper they are just trying to read the graffiti on his El Camino. Flames were hand-painted by King during his Huntsville Speedway days. 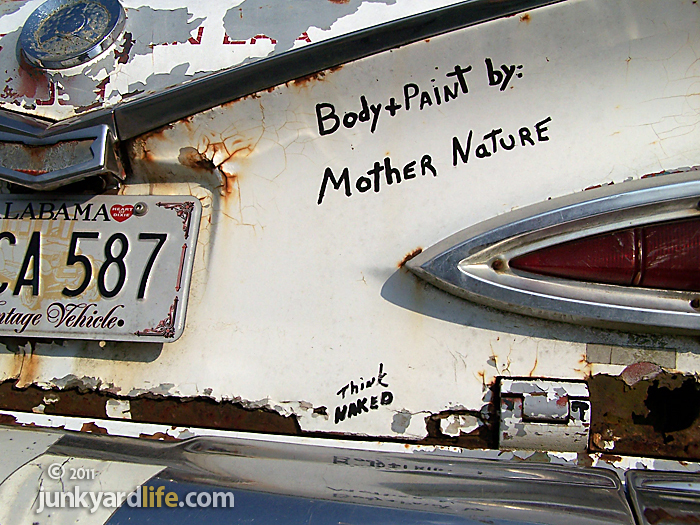 King, an unwitting trendsetter at the time, painted the El Camino with flat white paint in 1989. “You see these flat paint jobs all over now,” King said, noting his foresight. 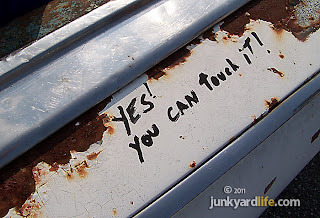 A keen eye will also notice the faint hint of red lettering along the bed of the truck. King spent two decades working at Huntsville Speedway, a quarter-mile round track in north Alabama. 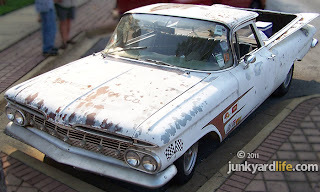 “I painted ‘Hunstville Speedway’ on the sides when I started working at the track.” Nowadays, car magazines and show vehicles mimic weathered lettered doors of vintage shop trucks. 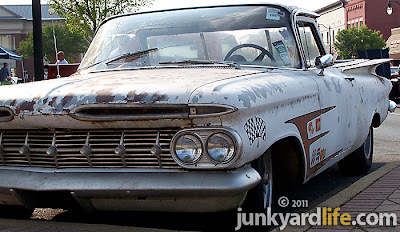 King’s El Camino patina is raw and real. King continues to add character to his ride and doesn’t mind making fun of his El Camino’s less-than-concours condition. “I grabbed a Sharpie and wrote a few things on it,” said King. 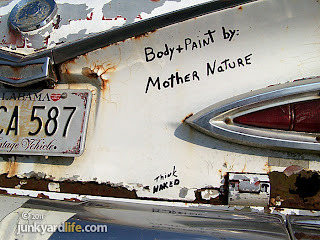 ‘Body & Paint by Mother Nature’ is scrawled on the tailgate. Just below that in thick and thin strokes of black ink, you will find the words ‘Think Naked.’ They are written small and have an arrow directing your eyes to a rusty splotch. “People pass me, then slow down to take pictures or ask me what it says,” said King. King lights up when talking about his adventures in the Elky. It’s no wonder he would never consider selling it but it won’t stay in the family after he is gone. “My son’s friend, Brock, has loved this car every since he was little,” King said. “I told him I would leave it to him when I’m gone.” King’s two sons, now 25 and 21 years old, were OK with the idea. 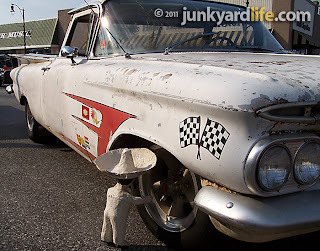 The youngster's enthusiasm for King’s rat rod El Camino hasn’t waned. 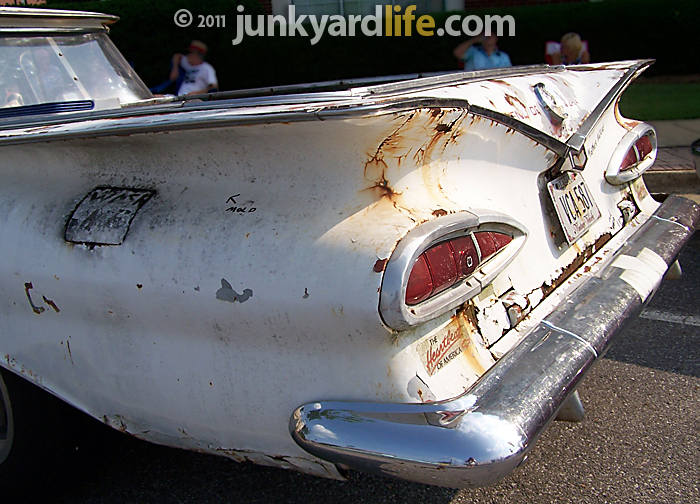 “Brock asks about the ‘59 whenever I see him.” Chances are that King's El Camino will be making road trips around the U.S. for many years to come. 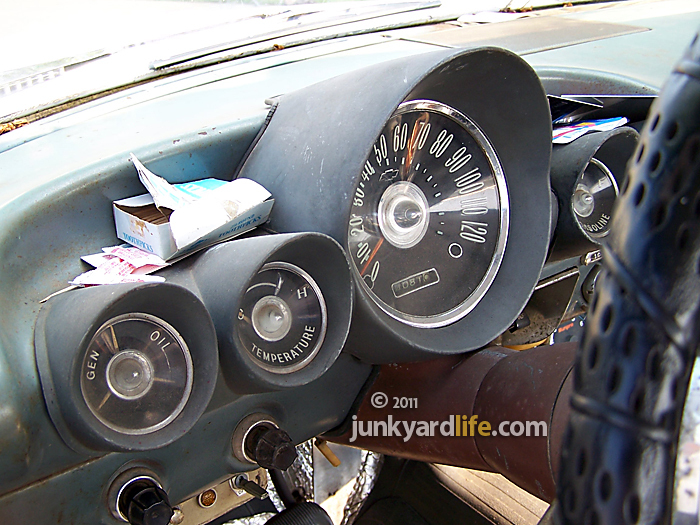 Essentials for the road: four-speed, tachometer, foil, Duct tape. 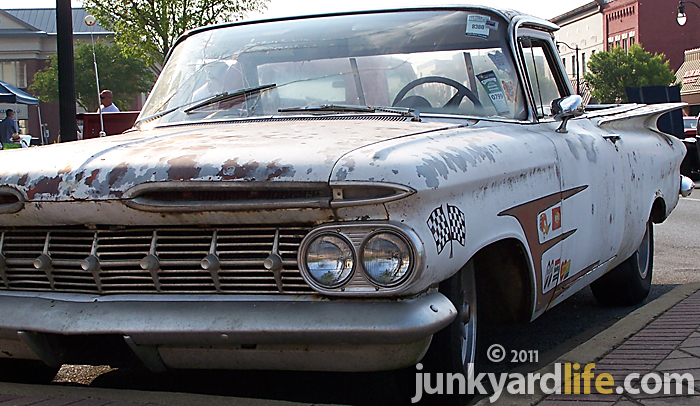 King's custom 1959 El Camino is part traditional hot rod and part rat rod. It draws crowds. King made the rear glass from a sheet of Lexan. He could replace it but the Elky would lose some hard earned character. King was offered a grand for his wheels in Bowling Green, Kentucky. 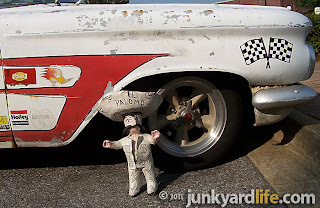 'Carlos' is no cry baby, show car doll. 1959 Chevys had distinctive fins and cat eye tail lights. 1959 El Camino's tag spring loaded to be visible when tail gate drops. 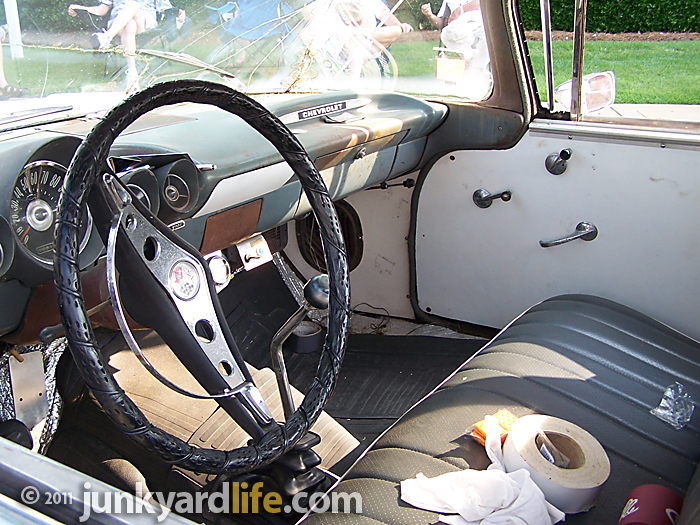 Four in the floor and an Impala steering wheel. 1959 was the first year Chevrolet built a steel bed floor in a truck instead of wood. 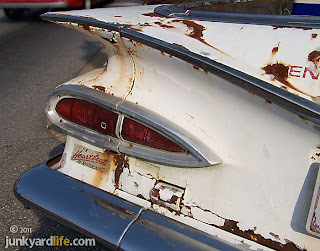 22,246 Chevrolet El Caminos were built during the 1959 model year, their first year of production. Look closely for the 'mold' and 'wash me' graffiti. 1959 El Camino gauges and King's box of toothpicks. Dog under King's hand-made Lexan rear window with braces. The rear window blew out one time, so he made sure it would stay. Indianapolis Motor Speedway is definitely not flat. It's banked quite heavily. You are right. The Indy track is not flat but the 9 degree banking at Indy seemed tame to me when I took the tour on a bus. I'm used to Talladega Superspeedway's 33 degree banking - an elephant could drive a school bus around that track. The mention of Talladega here just brings me back to the Will Ferrell's movie of the same name. And I agree: you can't exactly be enticed to play shotgun with an El Camino of this state. That is seriously awesome. I thought I was the only person rolling around with that kind of attitude. Glad to know there's at least one more. Sad.No pride in the ride. I hope he at least bathes. Keep it the way it is, these neg. comments are most likely from people who only wish they had one, we have 2..
Who needs a ride with a 5 grand paint job, not me..
Thumbs up to you for keeping it real.